Washington, D.C.: A plan from the U.S. Environmental Protection Agency (EPA) to dramatically tighten federal ozone limits will impose new and damaging regulatory restrictions across 56 percent of Virginia’s economy. These restrictions may also make traffic congestion even worse in the D.C. metro area and along the I-95 corridor, according to a new economic study commissioned by the Center for Regulatory Solutions (CRS), a project of the Small Business Entrepreneurship Council (SBE Council). 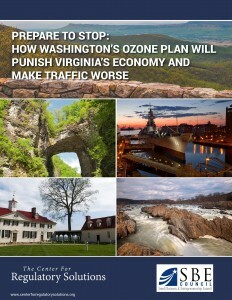 The report, “Prepare to Stop: How Washington’s Ozone Plan Will Punish Virginia’s Economy and Make Traffic Worse,” also highlights the strong and broad-based opposition to this overreaching federal policy, which ignores the Commonwealth’s history of environmental progress. Through interviews, letters to the Obama Administration and other channels, a bipartisan coalition of state lawmakers, local officials and leaders from the business and labor communities are sending an unmistakable message to Washington: This ozone plan goes too far. Newly released polling shows that Virginia voters are also wary of unwarranted federal environmental controls over the Commonwealth’s economy and job creators. A statewide public opinion poll jointly commissioned by the National Association of Manufacturers and the Virginia Manufacturers’ Association found 78 percent of Virginia voters rate their local air quality as “Excellent” or “Good.” Strong majorities believe that stricter federal air quality regulations will: make it harder for local businesses to start or expand (63 percent); increase the price of everyday goods and services (74 percent); and increase the amount they pay in taxes (78 percent). By a wide margin, Virginians think that less economic growth and fewer job opportunities caused by regulations are a greater problem for their home state (64 percent) than lower air quality caused by pollution (23 percent). Furthermore, barely more than a quarter of Virginians (28 percent) said they were willing to tolerate more traffic delays and longer commute times in order to comply with stricter federal air quality regulations. Virginians’ concerns reflect the widespread opposition across the country to the EPA’s plan. As detailed in today’s report, local and national groups representing cities, counties, transportation departments, agricultural agencies, state-level environmental regulators, labor unions, construction companies, energy producers, manufacturers and many other stakeholders have all sounded the alarm. These diverse stakeholders are pleading with the EPA to stick with the existing 75 ppb standard, which was set less than a decade ago and has yet to be fully implemented. President Obama withdrew EPA’s plan to dramatically tighten the federal ozone standard in 2011, citing concerns about the regulation’s impact on the economy. Local officials, labor union members, businesses and many others are once again expressing these concerns as economic conditions continue to present challenges for many regions of the country and for many industries. By lowering the National Ambient Air Quality Standard from 75 parts per billion (ppb) into the 65 to 70 ppb range, EPA would cause at least 12 counties and 7 independent cities in Virginia to be in violation of federal law. These are some of Virginia’s most populated counties, concentrated around the Washington, D.C. and Richmond metro areas, but a number of Virginia’s rural counties along the I-95 corridor may be dragged into nonattainment as well. The new tighter standards would also likely cause Virginians to face longer and worse traffic jams, especially in Northern Virginia and along I-95. A report by the Institute for 21st Century Energy calculates that the Virginia Railway Express (VRE) RF&P Line capacity extension and Virginia’s $2-$3 billion project to address extreme congestion on I-66 outside the Capital Beltway are in danger of having their federal funding withheld if Virginia does not meet emissions targets. A large portion of Virginia’s economy, population, and workforce could be caught in the net of ozone nonattainment under the EPA’s proposed range. The 12 impacted counties and 7 independent cities represent 56 percent of the Commonwealth’s GDP, 47 percent of the Commonwealth’s workforce, and 44 percent of the Commonwealth’s population. Virginia’s power plants will face the dual challenge of more expensive inputs (as this rule will confer costs on energy production) and expenses associated with its own compliance (i.e. the purchase of selective catalytic reduction to control NOx) – the end result of this “tax” on industry – is higher residential and industrial energy costs. Under the proposed range for the EPA’s new ozone NAAQS, a five county region stretching from Loudoun County, through Fairfax and including Arlington, Prince William and Stafford Counties, would be classified in nonattainment. These five counties that surround Washington, D.C. account for 41 percent ($195.1 billion) of state GDP and nearly 32 percent of the state’s workforce (1.5 million individuals). The transportation conformity provisions associated with the standard could delay, or in some cases completely block, the approval of badly needed investments in the transportation network that is already struggling to keep pace with Virginia’s rapid population growth. The D.C. metro area already has the worst traffic congestion in the U.S. Among 101 cities surveyed for urban mobility and congestion, the Washington D.C. metro area ranked first in both annual hours of delay per peak auto commuter as well as cost per peak auto commuter, and 9th in commuter stress. These problems would be exacerbated if the EPA withheld federal transportation funding through transportation conformity. Under the proposed range for the EPA’s new ozone NAAQS, a five county region including Chesterfield, Charles City, Henrico, Hanover, and Caroline counties would be newly classified in nonatt0ainment. The five counties that surround Richmond account for 12 percent ($57.5 billion) of state GDP and nearly 13 percent of the state’s workforce (644,795 individuals). Many of the counties in the Richmond area are still struggling with high unemployment. Caroline and Charles City Counties both currently have unemployment rates at or above the federal unemployment rate (5.5 and 5.6 percent respectively). The economic burdens from this regulation will hit the hardest in Chesterfield and Charles City Counties where the manufacturing sector represents a significant portion of employment (5 and 13 percent respectively). Even more alarming is that three of the five Richmond-area counties suffer from high levels of poverty, ranging from 11.3 to 14.5 percent. Most Virginia voters (54 percent) oppose any additional environmental regulations on businesses, believing these would have negative impacts on the economy through higher taxes (78 percent), higher prices (74 percent), and making it harder to start or grow businesses (63 percent). By a wide margin, Virginians think the bigger problem for their local area is “less economic growth and job opportunities caused by regulations” (64 percent) rather than “lower air quality caused by pollution” (23 percent). Fewer than two-in-five (39 percent) think that the federal government should implement stricter environmental regulations on businesses operating in their local area. Furthermore, barely more than a quarter of Virginians (28 percent) said they were willing to tolerate more traffic delays and longer commute times in order to comply with stricter federal air quality regulations. Scott K. York, Chairman (R), Loudoun County Board of Supervisors: “It has recently come to my attention that the Environmental Protection Agency (EPA) is considering a lower standard for ground-level ozone. Mahlon G. Anderson, Managing Director of Public and Government Affairs, AAA Mid-Atlantic: “We all want cleaner air in our region… [which] is now close to meeting current federal ozone standards. But … the last thing our region’s beleaguered commuters need is another obstacle to improving their horrible, near-worst-in-the–nation commutes. James M. Holland (D), Board of Supervisors, Chesterfield County: “Given the strict new ozone standard being proposed, much of the nation would not be compliant. Recent state monitoring data measured Chesterfield County at 69 parts per billion, which would exceed the proposed ground-level ozone limit of 65 parts per billion. The consequences of this status would be severe. Businesses looking to locate or expand in our area would face significant new red tape. They would be forced to install costly emission reduction technology in order to meet these standards. In some cases, regardless of what steps are taken to comply, the standards could not be met. Randy Nelson, Lynchburg City Councilman: “It concerns me that implementation of the new standard could have a negative impact on economic development and job creation in the Central Virginia region. The economy in this area is still recovering from the recession, and our manufacturing industries have been particularly hard hit. “Compliance with a significantly reduced ozone standard could impose additional regulatory costs on existing businesses as well as prospective new employers that we are trying to attract to our region. Jobs could even be lost. Also worrisome is the potential for tailpipe exhaust inspections similar to those that are routinely conducted in Northern Virginia that could result in increased costs on automobile owners. Morgan Griffith Virginia Representative (R) (VA-9), U.S. House of Representatives: “The EPA has proposed reducing ozone National Ambient Air Quality Standards from 75 parts per billion (ppb) to a lower number between 65-70 ppb. This would set more stringent regulatory standards on Virginia and U.S. manufacturers and communities before existing standards are put into full effect. If this isn’t enough, it’s not clear this ozone reduction proposal would produce EPA’s predicted health benefits. This EPA proposal, with its unclear health benefits, is estimated to cost hundreds of billions of dollars each year to implement. It is bad policy based on questionable science. Dr. Charles Battig, President, Piedmont Chapter of Virginia Scientists and Engineers for Energy and Environment: “EPA reports that the six major Clean Air Act pollutants have declined some 62% on average. Meanwhile, reported asthma incidence has risen from 8.9% in 2005 to 9.4% in 2010. How can that be?